This is my first pregnancy, and these boys were very much a surprise! Me and my husband found out we were pregnant a couple weeks after our one year anniversary. At about 10.5 weeks I had my first ultrasound and there were two! We couldn't be more excited! I was very sick for the first 18 weeks, but am feeling much better now. Finally putting on weight. Doctor hasn't said anything about bed rest or C-section yet, so I'm still going strong at work until then. Both boys are head first as of right now, perfectly healthy, no developmental issues, and measuring big by a couple ounces. They are due around the end of February, beginning of March (2012) time frame if all goes as planned. 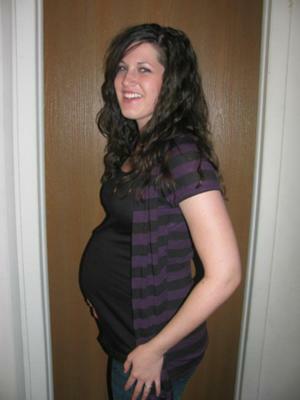 Comments for 24 Weeks 3 Days Pregnant With Identical Twin Boys! Hello Renee, i am expecting my twin boys by end of february to mid march, they are so far doing well and both head down in position. At my 21 weeks one of them was breach and the other head down, at 26 weeks they were both breach, at 30 weeks one was breach and the other traverse, this situation stressed me as i sew that they kept changing positions but now i am happy that there seems to be hope for vaginal delivery since they are both head down by now and there is no more room for them to turn since they are also growing. I also was very sick for my first 15 weeks but now i am doing well eventhough i havent gained weight at all. Good luck. That's great, My wife and I are expecting identical boys sometime in January, and needless to say the anticipation is becoming pretty unbearable (especially for my wife). She's 33 weeks this week and is still working five days a week. Both started breech and are now head down Although B didn't flip till around 31 weeks. Good luck and hang in there.